Finding adequate words to convey the unbelievable beauty that characterises the Grand Canyon is an arduous job indeed. 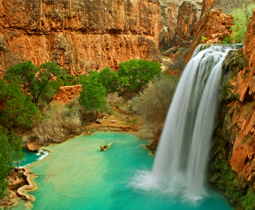 However, this wonderful naturally rugged haven cannot overshadow the rich diversity found in the US state of Arizona. From cities that are full of life to silent mountain regions, from warm desert to snowy crests, from ancient ruins to nature parks, in Arizona all tastes are satisfied. Experience the incomparable colours of the Grand Canyon sunrise, hike, ride or sail your way across the state’s varied landscapes or drive yourself through secluded highways and scenic roads, become one with the state’s nature. And you will still not have enjoyed all Arizona has to offer. From red rocks, ghost towns and pioneer charm exuded by North Central Arizona to the wildly adventurous water sports opportunities offered by the Western Arizona destinations of Kingman, Lake Havasu and Yuma. Stopover in Central Arizona with its sun kissed Sonoran Desert and its bustling urban communities surrounding the Phoenix metro area. Enjoy scenic visits to Fountain Hills and Fort McDowell Indian Reservation or to Wickenburg where rodeos and ranches evoke Wild West imagery. Touch down in Southern Arizona home to the large metropolitan area that is Tucson. Here, bird watching, wine tasting and historical reenactments will complete a truly memorable visit.